Christians need to focus on the meaning of the cross. This is "Good Friday", which seems a misnomer. It was good for us, but bad for Jesus, it seems. But hang on, Sunday's coming! On the day often called Good Friday many Christians will commemorate the Crucifixion of Jesus Christ. The Creator put on human flesh and died a horrific death on the Cross. Rather than worshiping Him as their Creator and God, most people rejected Him and sentenced Him to death. How could the day associated with mankind’s heinous act possibly be called good? The answer to this question is found in the purpose for Christ’s death. Jesus said that He “"did not come to be served, but to serve, and to give His life a ransom for many"” (Matthew 20:28). Since we have all sinned against the infinitely holy God, we deserve to pay the price for our rebellion—death (Romans 3:23). But praise God for His mercy and grace! Rather than condemning us for our sin, the Bible tells us that God so loved the world that He sent His only begotten Son to take the punishment we deserve (John 3:16; 1 John 4:10; 2 Corinthians 5:21). 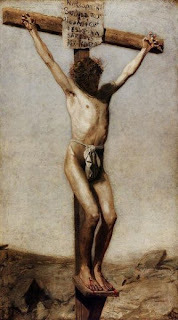 You can further survey the cross by reading the rest of "The Crucifixion", here.